One small problem. 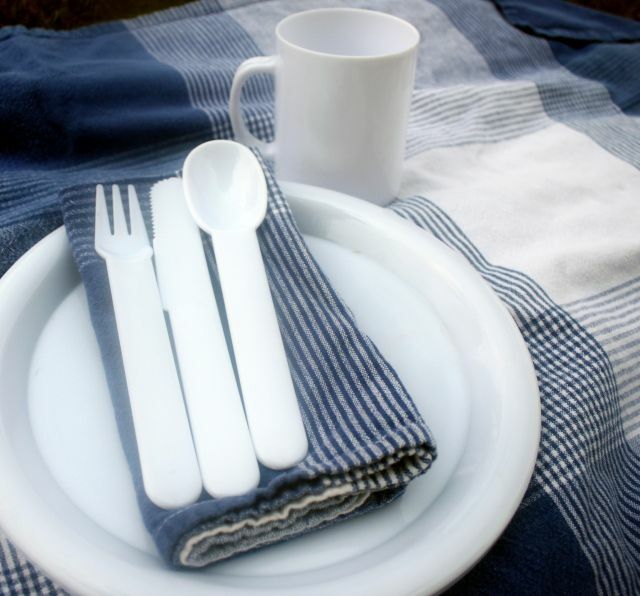 The picnic dishes are made from plastic of unknown origin. 15 years ago, we did not know to ask if our plastic contained BPA. Otherwise, I am sure the person who gave us this set to as a wedding present would have made sure it is BPA free. I’d rather not the kiddos eat off plasticware that even I don’t know what is in it. Our old plastic picnicware. Your days are numbered. This is as good as time as any to replace what should have been replaced years ago with plastic free alternatives. Since some of the parks we visit have a no glass policy, I hoped to replace our plastic picnicware with green but non-glass or plastic ware since it may live in the trunk of a hot car during a trip. Heat + plastic = could leach chemicals into our food. No thanks. Thrift stores only had heavy ceramic dishes which is not what I want to carry in my picnic basket the major distance between our parked car and a musical festival. I poked around a few more stores. The best I came up with was lightweight melamine dishware. My research does not confirm or deny if melamine dishware is safe. However, after the past melamine dog food recall, I’m personally suspect of anything containing melamine. As always, your mileage may vary. I ended up at World Market and thank eco! World Market saves my bacon – and wallet – again. And speaking of bacon, I'd buy this little pig grill and use it only for vegetables for irony. I put the paper cup on it to show that it's smaller in real life than it looks online. As a precaution, I took a photo with my phone and emailed it to Husband. 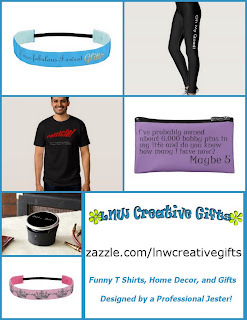 You know, in case he gets stuck on what to buy me for my birthday or something. I decided against using the food domes as plates when I found lighter weight bamboo plates in another part of the store. I found I can buy real silverware in singles instead of big sets. Perfect! I can buy only the number of picnic place settings I need. The hard part was trying to decide what pattern to buy. The curly one on the left is my favorite. 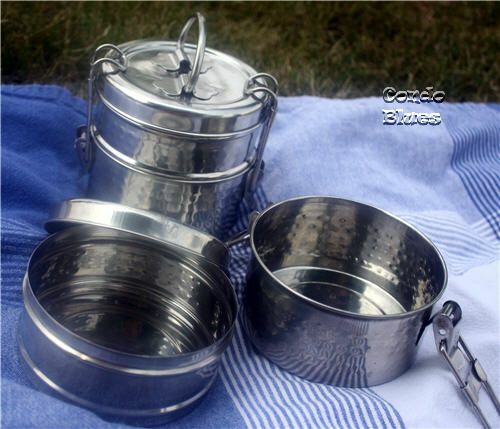 I also picked up two stainless steel tiffins to store and eat food from on camping trips and picnics. We often bring breakfast food to eat in our hotel room to save time and money. The tiffins will be great impromptu cereal bowls. When we aren't picnicking or traveling, we can use the tiffins for work lunches. These tiffins hold food in the both the top and bottom compartments. I created a great zero waste, plastic free picnic for the kids during our backyard BBQ! The package says the bamboo plates are one time use and compostable but since most of the time we only use a plate for sandwiches, I suspect I’ll get years of use from the plates before composting them. I was pleasantly surprised after I made my purchase they gave me a code to get 15% off the price of Southwest plane ticket as part of the World Market Buy and Fly promotion. Too bad I already bought my BlogHer plane tickets months ago (pre cancer treatment bills) to use it. 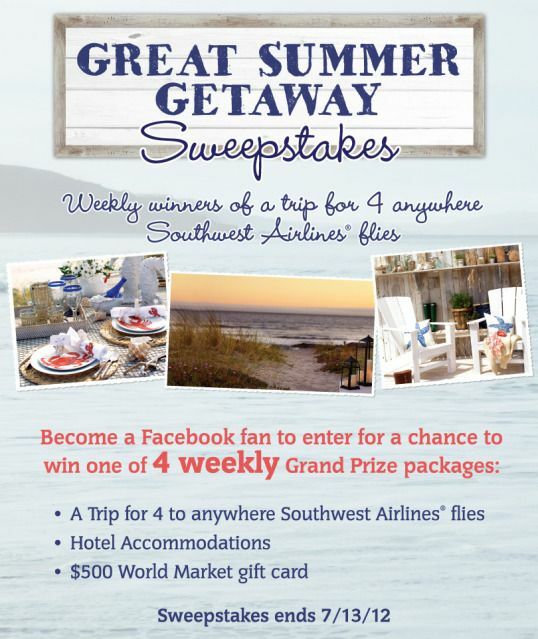 If you don’t need to buy a plane ticket either, you can try winning one by entering the Cost Plus World Market Summer Getaway Sweepstakes for a chance to win four tickets to anywhere Southwest flies, hotel accommodations, and a $500 Cost Plus World Market gift card. You could also consider Corelle plates. Some are practically indestructible and are not as heavy as ceramic. 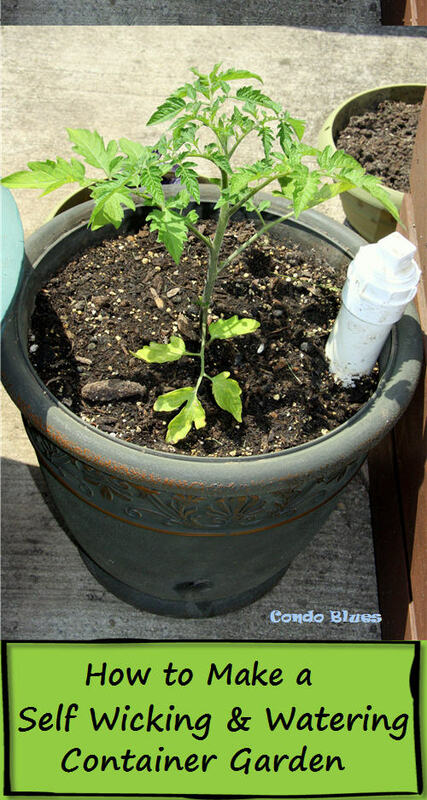 They're what we use on our patio and in our picnic backpack. What a great post! I love World Market and it's impossible to get out of there with some amazing stuff! I love those silver lunch pails and the bamboo plates! Love WM! Great ideas for a greener picnic Lisa! Make sure you take your BPA dishes to the dump for hazardous disposal. Don't laugh, I have a ton of items to take to ours. 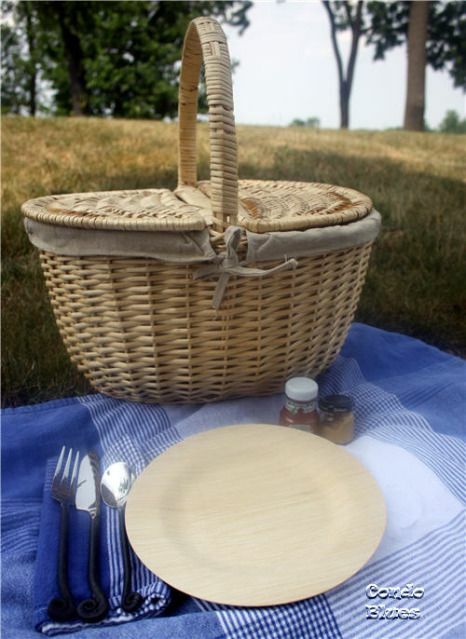 I love both picnic baskets! !